This was a summer of milestones. On the date of this particular milestone, my 9-year-old, Ava, learned about chivalry and my 7-year-old, Calvin, learned that it’s close to non-existent. These lessons can be attributed to their inaugural all day trip down the Namekagen River in Wisconsin, when 2012 marked the first year that this typically grown-ups only outing was voted kid-friendly, if not mom-friendly. 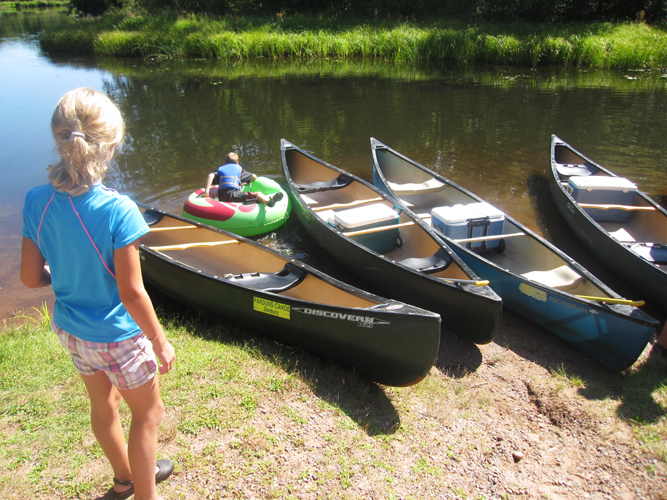 On our chosen Saturday, we head out with the kids to Danbury, WI to Pardun’s Canoe Rental. Our very own Julie McCoy (aka Sarah) calls them up each year — they know her by name — and she rents everything for the group, which amounted to 20 some people with 8 canoes and 10 inner tubes. Breakfast is optional at the restaurant in Danbury, but we bypass it this year in favor of getting a later start. 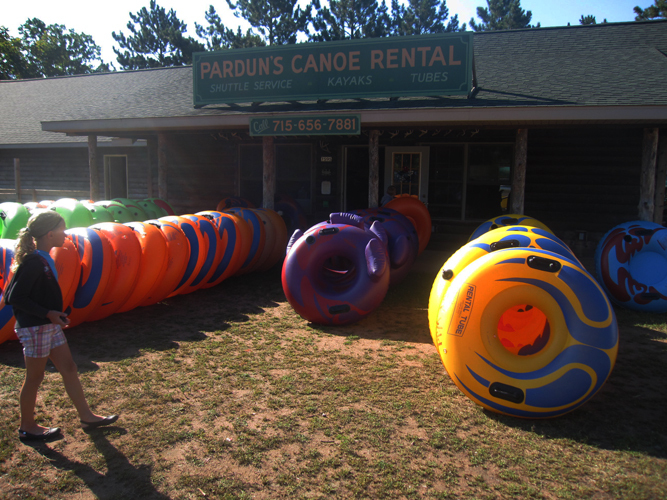 At the canoe place, everyone corrals all of the gear near our two van buses and the kids select their inner tubes of choice – bottom or bottomless, chair back or not, and orange, green, blue or purple. All come equipped with a built-in drink holder. The kids cannot resist snaking through the center of the lined-up bottomless inner tubes. This whole loading process takes about 45 minutes. Then we climb into the dusty vans and head up river, canoes trailing. Luckily the incoming dust is kept to a minimum with the new paving of a good portion of the trip’s route. The drive takes about 20 minutes. It’s now 10:00a.m. We pile out and move our stuff to the river entry point. Coolers, chairs, towels, sunscreen — the works. It’s a beautiful day. We shove off and get our entourage connected with bungy cords and ropes. And soon after, some choose to disconnect. I watch my husband opt out of the canoe for the inner tube and completely detach from us. I was sure I could handle it and navigate with one kid in the canoe and one kid in the tube connected by rope. After all, it’s a peaceful river, really… One that is clean, clear, meandering and virtually free of any development. And free of rapids. Save for the huge crisscrossed trees we came upon when we took the wrong fork in river. I fought the current for a while, trying to turn us around to glide through the narrow entry. No such luck. When help arrived on his solo floatation device it was in the nick of time to untangle Ava’s leg from the rope that kept trying to drag her under. Okay, I might be exaggerating here, but it was really hard to assess what was going on. I was ready for an adult beverage. Our canoe plus still needed a bit of maneuvering. 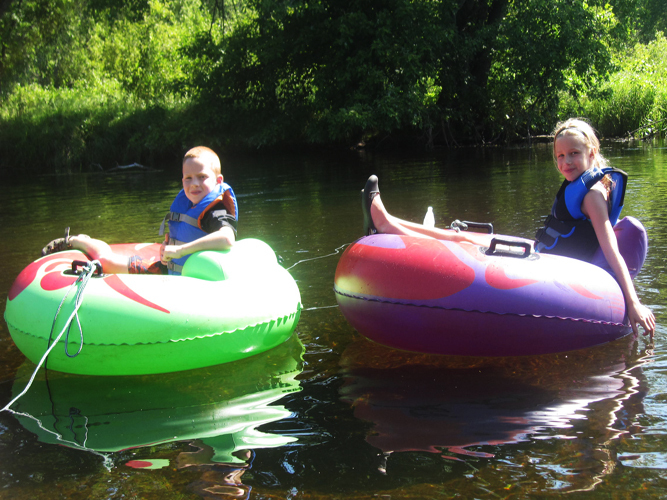 By this time, Ava opted back into the canoe and Calvin took to the tube. 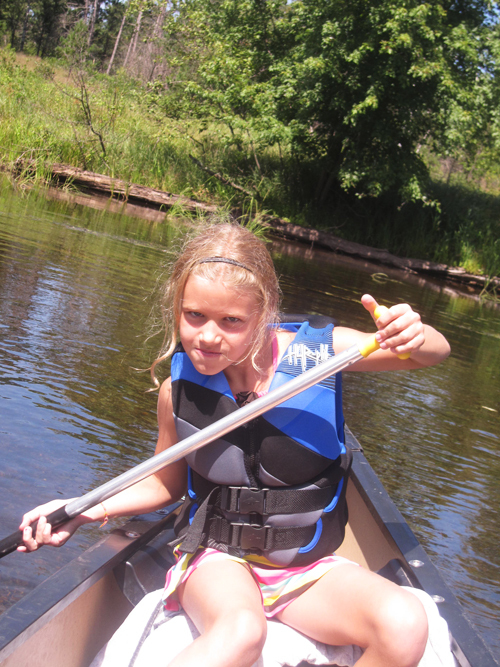 Ava turned out to be a quick learner and diligent paddler. We rested easy for a while, then we came to the concrete bridge. The current pace picked up and by some magnetic force, we were pulled in the exact direction I aimed to avoid – right into a fallen tree that hovered over the river about three feet. With a shove of my paddle, Calvin sailed out of harm’s way. Ava ducked and I got totally horizontal to grab the lowest threatening branch with both hands. After that limbo, the canoe rocked from side to side and onlookers said later that they were sure we’d tip. I was too off-guard to do much of anything to avoid the concrete pylon that supported the bridge above. Luckily we sailed through, but it was too late to pull over at the stop immediately to the right. We ended up downstream on the left a bit, too taxed to paddle upstream. That’s when Ava, Calvin and I had the talk about chivalry. Five minutes later, my relaxed husband floated over to us singing the praises of the detached inner tube ride. I suggested Calvin try it out with him. I was down one kid. Things were looking up. Mid-journey we pulled over to a sandbar so the adult boys could toss and catch the football one-handed and a few of us girls could do the same with the 10-13 year-old boys. We ate lunch, snapped some photos, hunted down fish and shells of sorts. At the upstart again – I took to the tube and made use of the drinkholder. That did work slick. I could see where he was going with this. Then, all to soon (5:00p.m. ), it was over. Our crew, tied together via Luck, WI, highschool graduates, all made it through unscathed. 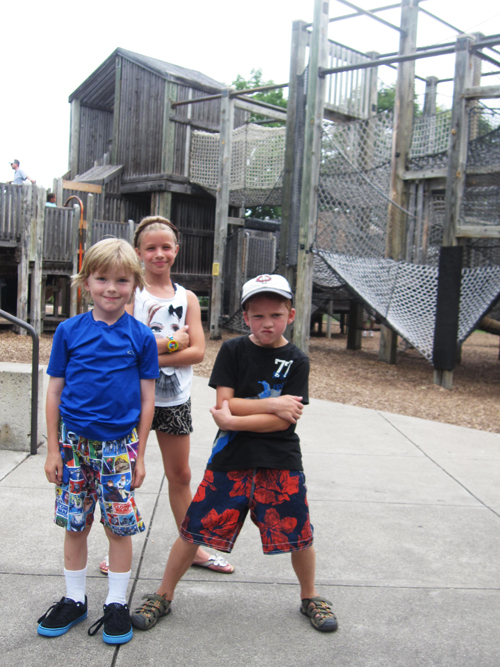 The kids (ages 4-14) got to know each other a bit more, we didn’t have the challenges of finding daycare and it was reassuring to know we could pull off an all-day friend and family outing. We’ll be smarter about the equipment next time – solo tubes for this family, perhaps? And, in closing the debate around chivalry, I’m curious – what do women think? With the rise of the independent woman, might it be considered a thing of the past? What sort of gestures are chivalrous? Ava was taking this all in… I informed her, it’s okay to accept it when the time is right. Like today for instance…. furthermore, if it does not come your way, step up and be your own warrior. She thought about that for a moment, grabbed the paddle, and did just that. On a recent steamy Sunday, we pulled out our authentic picnic basket complete with casual dishes and silverware all strapped into their appropriate place. My 7 and 9-year-olds put together a menu, I ran to the store and then we took an hour to craft everything that went into our little basket. It certainly could have been easier, but I chose to make it a little exercise in sustainability and creativity. The kids formed a sandwich assembly line with ham, cheese, arugula, mayo and mustard options. We also invited one of my son’s friends. The friend’s sandwich creation was left to the discretion of my son, Calvin. We wrapped them in Wrap-N-Mat’s and initialed them so there would be no confusion – my daughter, Ava, did not want to find arugula in hers after all! The chips were counted out and packaged, also initialed. I peeled and sliced cucumbers and packed them with sea salt and humus. 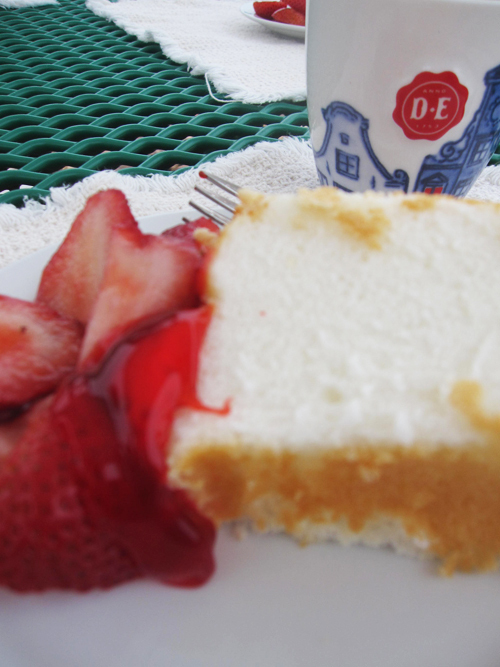 Then came the angel food cake – – an immediate first suggestion in the picnic planning process. We cut four precisely equal slices and packaged them together in one clear container. Cut strawberries and glaze were thrown into the little basket too. The kids rounded out the basket after a quick check – adding cloth placemats, ice packs, another set of plates (for dessert of course) and glasses. Now, the basket didn’t have any insulation mind you, so we did need to cheat with a mini cooler for drinks. We picked up my son’s friend around noon and headed west to our destination: French Regional Park. 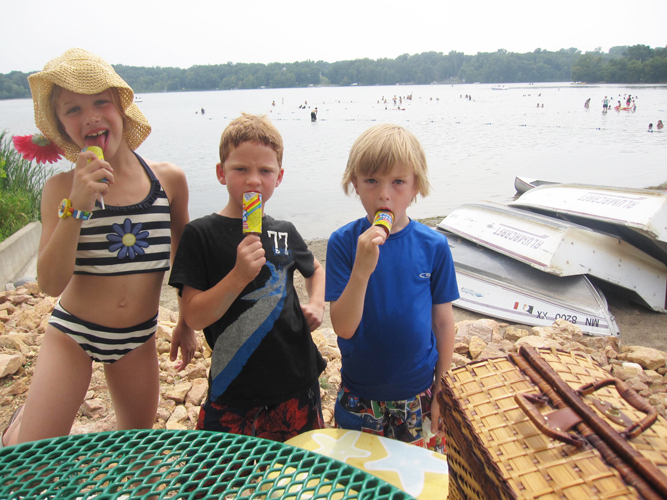 We have made it an annual outing for the past three years and have found it to be a clean, family friendly park with boat access, rentals and a sandy beach on the north side of Medicine Lake in Plymouth, MN. As we pulled in, my kids chimed in, Hey, we were just here on Thursday. So much for originality. Apparently, they had just been to FRP with the kids from their summer camp. The two main parking lots were packed by 12:45, but we managed to nab a slot near the climbing area. We left the basket and beach stuff in the car while the kids climbed, swung and slid. They found some bizarre tunnel route around the play area which was an adventure. After about 20 minutes and a quick stop at the car for our stuff, we caught the trolley that would bring us to the beach area. We set up shop at a table with an umbrella overlooking the beach area. The kids went for a swim and immediately worked up an appetite. Out came the basket. We set the table, poured the drinks and enjoyed our lunch. Other families were grilling out (one brought their very own large grill and wheeled it right onto the trolley) and having their elaborate picnics too. Clean up went smoothly without the paper products to dispose. We recycled two bottles and stowed the rest back in the basket. More swimming and best hand-stand contests. Then it was time for sand castles, moats and all. The three of them spent about 30 minutes tunneling, shaping and building. Suddenly, Calvin remembered there was angelfood cake yet to be consumed, so we headed back to our table, took out the next set of plates, glazed the cake, added the strawberries and indulged. Clean up for the dessert portion was more tricky due to the glaze, but I was able to rinse them off in the sink at the rental station. So, was the dishware, silverware and fare all worth it? For me, yes. I think the kids didn’t notice too terribly much. They were focused on sneaking away to check out rental items and rates. They came back, to my surprise, with a round of orange push-pops all thanks to my son who brings his wallet everywhere and has a habit of buying rounds for him and his friends. We packed up, trolleyed back to the lot and dropped off Calvin’s friend around 3:30. We had a discussion about the basket and how we could make more sustainable choices in our everyday activities. We try to make it fun and interesting with reusable products from our gingham Wrap-N-Mats for sandwiches to funky water bottles. Sustainability on the run requires a bit more planning, but if that becomes second nature to my kids, I’ll consider it a good thing.